Among the world’s major advanced countries, the United States remains a demographic outlier, with a comparatively youthful and growing population. This provides an unusual opportunity for America’s resurgence over the next several decades, as population growth elsewhere slows dramatically, and even declines dramatically, in a host of important countries. In the 1950s and 1960s, a relatively youthful population helped drive rapid economic growth first in Europe and then in Japan. By the 1970s, this “youth bulge” shifted to developing nations of east Asia, notably Singapore, South Korea, Malaysia and Indonesia. China experienced this surge in workers in the 1980s and 1990s. More recently, the big winners in youth demographics could be found in countries such as Vietnam, Turkey and Brazil. Yet remarkably throughout this period, the United States has retained its relative youthfulness. The last census showed the nation experienced 10 percent population growth over the first decade of the 21st Century, with a final count approaching 310 million people. This is in large part a product both of immigration and higher birthrates. Today, the U.S. fertility rate of over two children per woman remains as much as twice as high as many countries, including Russia, Germany, Japan, Italy, Singapore and Korea. 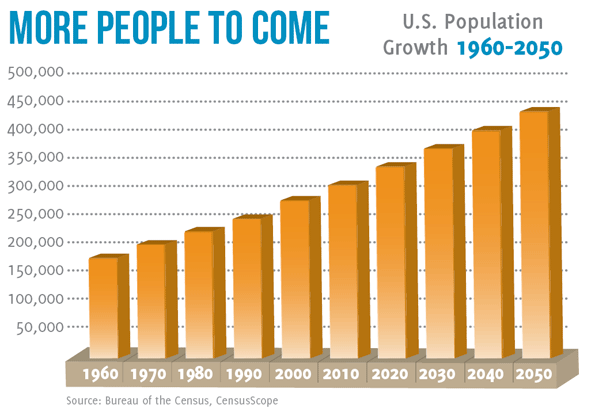 As a result, according to U.S. census projections, the United States will continue to grow to upwards of 420 million by 2050. In contrast, the populations of longterm competitors among advanced countries—including the European Union, Japan and Russia—are all expected to stagnate and then decline. Japan is a particularly hard case. Its fertility rate has dropped by a third since 1975. By 2015, a full quarter of the Japanese population will be over 65. Generally inhospitable to immigrants, Japan could see its population drop from a current 127 million to 95 million by 2050, with as much as 40 percent of the population over 65 years of age. By then, no matter how innovative the workforce, Dai Nippon will simply be too old to compete. To a large extent, Europe shares this dilemma. By 2050, Europe’s population, now numbering 730 million people, will shrink by 75 to 100 million. Italy’s population alone is slated to drop by 22 percent, while Poland’s will be reduced to 15 percent. Due to the one child policy and rapid urbanization, China’s population growth is also expected to slow significantly in coming years while the proportion of seniors soars. In the longer run, population growth will be stymied by a large surplus of boys over girls. As a result, notes demographer Nicholas Eberstadt, more than 25 percent of men in their late 30s by 2030 are likely never to marry. Perhaps even more challenged will be Russia, whose low birth and high mortality rates suggest that its population will drop 30 percent by 2050 to less than one-third of that of the U.S. Even Prime Minister Vladimir Putin has spoken of "the serious threat of turning into a decaying nation." Russia's de facto tsar has cause for concern. Throughout history, low fertility and socioeconomic decline have been inextricably linked, creating a vicious cycle that affected once-vibrant civilizations such as ancient Rome and 17thcentury Venice. Within the next four decades, most of the developed countries in East Asia, as well as Europe, will become veritable old-age homes: A third or more of their populations will be over 65. The U.S. will also have to cope with an aging population and lower population growth. Comparatively speaking though, the U.S. will maintain a relatively youthful, dynamic demographic. In comparison, the percentage of the population over 65 will be only one in five in the United States. The reasons for this divergence with other advanced countries likely includes such things as continuing immigration, greater space, larger houses, a strong aspirational culture and a higher degree of religious affiliation. Whatever the cause, a younger demography could lead to a relatively brighter future for America than is now commonly assumed. In the near future, the U.S. could reap a potential critical advantage from a particularly large baby ‘boomlet’ among the Millennial generation, the children of the boomers. 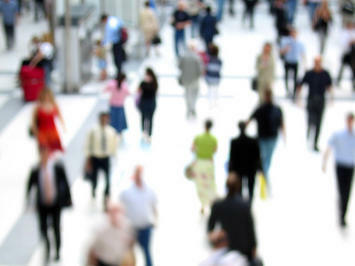 This next surge in population may be delayed if tough economic times continue, but over time it will translate into a growing workforce, sustained consumer spending and produce a youthful population likely to push innovation. The most critical shift will be in the growth of the American workforce which is expected to grow by over 40 percent between 2000 and 2050. In contrast, during the same period the number of entrants to the labor pool will decline by 25 percent in the European Union and Korea and plummet over 40 percent in Japan. Due to the rapid aging of China’s population, largely due to the impacts of urbanization, that emerging superpower’s workforce is expected to decline by 10 percent. These demographics suggest a far more difficult future for all these countries, as fewer workers support ever-growing numbers of retirees. China’s lack of an established social welfare system makes this transition even more problematic. Persistently low birthrates and sagging population growth inevitably undermine the growth capacity of an economy. In large part due to demographic forces, by 2050 Europe's economy could be half that of the United States’ economy. Even frugal Germany, by far Europe’s strongest economy, can expect its growth to be constrained by ever higher spending on seniors and a diminished workforce. By 2030, notes demographer Nicholas Eberstadt, Germany’s public debt will exceed 200 percent of GDP, with annual debt service accounting for 10 percent of GDP. To put this in perspective, that’s nearly twice Greece’s current burden of debt service. Other negative consequences of an aging and stagnant (or declining) population are less tangible, but no less real. Similarly, it is generally younger workers who drive innovation. Children provide a large consumer market and push their parents to work harder. By having children, people also make a commitment to the future for themselves, their communities and their country. In contrast, a largely childless society generally produces other attitudes. It tends to place greater emphasis on leisure activities over work. It also promotes a shift away from a focus on future growth and toward paying pensions for the aging. An aging society is likely to resist risky innovation or infrastructure investments meant to serve future generations. Yet in the immediate future, population and labor force growth present us with enormous challenges. Perhaps the greatest challenge in this era of economic stagnation lies in providing employmen—and adequate education—to a growing workforce. One cause of the U.S.’s persistently high unemployment and underemployment lies in the rapid expansion of the workforce from the large baby boom “echo” or Millennial generation. This growing workforce means the country needs to create 250,000 new jobs a month—twice what we produce in a “good” month today—just to stay even. Younger Americans may be unemployed at rates similar to their European counterparts, but in Europe the labor force will be shrinking. For the US to take advantage of its demographic dividend, we need to create the kind of rapid economic growth that sparks widespread job creation. 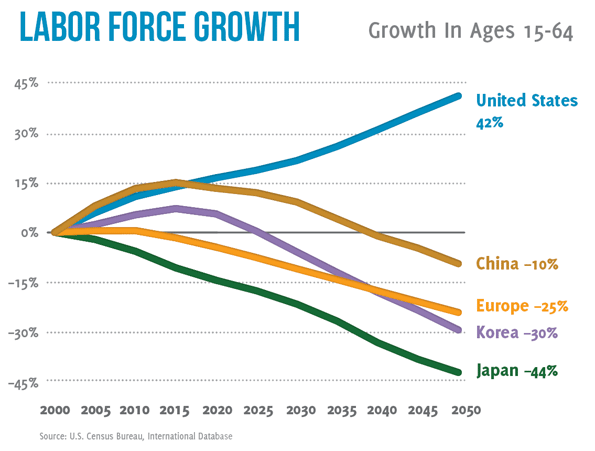 One possible, if unpalatable, alternative to meeting the growth challenge would be for the US to follow the path of demographic decline well under way in Europe and Japan. American birthrates, which were rising during the first part of the 2000s, have fallen with the recession and could conceivably become permanently depressed—as occurred in the 1930s—if prospects for economic growth fade. 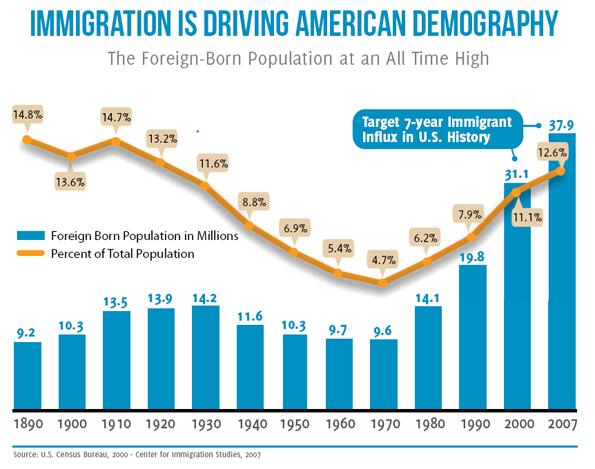 A weaker economy could also slow immigration, which has been one of the main causes for the country’s relatively favorable demographics. Roughly one-quarter of all the country’s elementary school students are either immigrants or the children of immigrants. Overall, Mexican immigrants, the largest group coming to the country, average 2.5 children per family compared to 1.8 to their Caucasian counterparts. Immigrants, particularly from Mexico, have been hard-hit by the recessions, in large part due to declines in construction and manufacturing where their losses have been higher than native-born Americans. This, not surprisingly, has created diminishing immigration levels across the country. Overall, migrants leaving Mexico, both legally and illegally, have dropped by more than two-thirds since 2005, according to that country’s census. Illegal immigration, according to the Pew Center, has fallen even more precipitously, from over 500,000 in 2000- 2004 to barely 100,000 in 2010. This pattern may continue in part due to lower birthrates in Mexico itself—where the average family size has decline from 6.8 children to barely 2.0—and by improving economic conditions. A drop-off in immigration from Mexico and elsewhere could be particularly problematic for cities such as New York or Los Angeles, long reliant on newcomers to make up for high levels of domestic outmigration. Already, migration to these cities is roughly 50 percent below the levels in 2000. In 2001, for example, New York welcomed almost 160,000 newcomers; in 2009, that number had dropped to barely 100,000. If tough times continue, these levels could drop even further, with profound consequences. Immigrants, for example, fuel much of the urban workforce. In Los Angeles, where immigration dropped by 40,000 annually over the past decade, immigrants constitute roughly half the total of those employed. Perhaps even more importantly, these immigrants have become critical to creating the kind of grassroots capitalism necessary to create jobs. In the last decade, largely immigrant populations such as Hispanics and Asians expanded their number of businesses at 50 percent higher rates than the overall average. According to the Kaufmann Foundation, the immigrant share of all new startups doubled from 14 percent in 1996 to 29 percent in 2010. The future of these new businesses could now be clouded both by diminishing immigration as well as stirring antiimmigrant sentiment. It is perhaps too early to know if strict controls on illegal immigration—enacted in states such as Georgia and Arizona—will slow down migration to other metropolitan regions but this has to be considered as a possibility. Ironically, many of these same areas have been those that were becoming increasingly attractive to newcomers escaping high housing costs in traditional coastal urban magnets. Another potential threat to America’s demographic vitality lies in the potential imposition of strong controls on suburban housing development. This is a policy widely supported among Administration officials and their green allies. In places like coastal California where such policies are already in place, housing prices remain artificially elevated, driving large numbers of young families into the interior and further out to other states. Generally speaking, people are far more likely to have children in singlefamily homes than in apartment complexes. These potential families also may be impacted by rising tax rates and fiscal burdens, particularly at the state and local levels. Without strong economic growth, it’s difficult to see how even the current level of public education—which is paltry, at best—can be maintained. Already poor schools in cities constitute a major reason why so many “young and restless” move from cities to suburbs; but if suburban education also declines, they may be left to send their children to private schools as well. It is logical to assume that, once forced to pay for schools, many parents will become hesitant to have multiple offspring. Yet ultimately the question of demographics—and its close link to the need for economic growth—represents a kind of existential question for civilizations. This is understood by some in Europe and Japan, where there have been attempts to increase benefits for families as concerns over demographic declines have grown. But can policy really change a society that is falling into demographic decline? So far state measures to encourage child-bearing have failed in a host of countries in both Europe and Asia. One possible solution for Europe, immigration, is now being curbed largely due to fears connected to people of Islamic heritage. Similarly, it is difficult to imagine how historically homogeneous China, Korea or Japan would be willing to accommodate large numbers of newcomers. Among the advanced Asian countries, only Singapore, with one of the world’s lowest birth rates, has contemplated using immigrants to stabilize workforce growth and prevent a process of hyper-aging. Some in the U.S., particularly on the far right, also oppose greater immigration, in part due to fears of the resultant ethnic shift away from a white majority. In addition, many environmental groups around the world oppose steps to revive birthrates. Some even consider procreation of new carbon-belching citizens as something close to anathema. In Great Britain, Jonathan Porritt, chair of the U.K.’s Sustainable Development Commission has advocated cutting the island's population in half as a way to reduce global greenhouse gases. For their part, some America greens have expressed concern over our country's relative fecundity. Groups like the Center for Biological Diversity and Greenpeace seek to see a cut in our slightly above replacement level birthrate. These pressures, as well as persistently low economic growth, could lead America into a Japanese or European style demographic decline. A growing population may create great environmental and economic challenges, but it seems clear that a scenario of persistent decline and rapid aging presents a far worse prospect. This piece originally appeared in Business Horizon Quarterly, published by the National Chamber Foundation. Joel Kotkin is executive editor of NewGeography.com and is a distinguished presidential fellow in urban futures at Chapman University, and an adjunct fellow of the Legatum Institute in London. He is author of The City: A Global History. His newest book is The Next Hundred Million: America in 2050, released in February, 2010.